Savannah sparrows (Passerculus sandwichensis) are common and widely distributed in North America. The distinctive yellow lores (eye stripe) is the best way to distinguish savannah’s from other sparrows with streaked plumage. 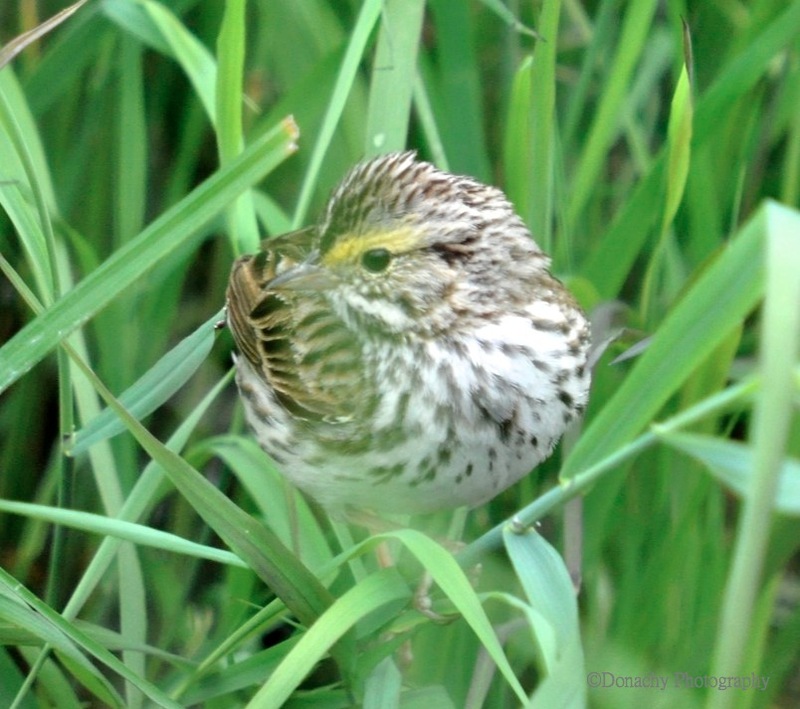 All across North America – including all over Alaska – savannah sparrows are a common sight in open fields and marshes and in low brushy areas. Mainly seed eaters most of the year, they include insects in their diet as well, particularly during the breeding season. Their song has been described as “insect like,” and although it has a buzz to it, the description doesn’t really do it justice. Listen for the notes of the savannah’s high, buzzy song next time you’re in an open area. They can be hard to spot in the low brush and ground cover they call home, but when flushed, they usually fly just a short distance and may perch to take a look around. About five to six inches from beak to tail, savannah’s nest on or near the ground, laying four to six blue-green eggs speckled with dark brown in cup shaped nests. The sexes are similar. Incidentally, the species name sandwichensis comes from Sandwich Bay in Unalaska, Alaska. This photos was taken at Potter Marsh, near Anchorage.